In our increasingly frantic daily lives, many people are genuinely fearful of the prospect of solitude, but time alone can be both rich and restorative, especially when travelling. Through on-the-ground reporting and recounting the experiences of artists, writers, and innovators who cherished solitude, Stephanie Rosenbloom considers how being alone as a traveller--and even in one's own city--is conducive to becoming acutely aware of the sensual details of the world--patterns, textures, colors, tastes, sounds--in ways that are difficult to do in the company of others. Alone Time is divided into four parts, each set in a different city, in a different season, in a single year. The destinations--Paris, Istanbul, Florence, New York--are all pedestrian-friendly, allowing travelers to slow down and appreciate casual pleasures instead of hurtling through museums and posting photos to Instagram. Each section spotlights a different theme associated with the joys and benefits of time alone and how it can enable people to enrich their lives--facilitating creativity, learning, self-reliance, as well as the ability to experiment and change. Rosenbloom incorporates insights from psychologists and sociologists who have studied solitude and happiness, and explores such topics as dining alone, learning to savor, discovering interests and passions, and finding or creating silent spaces. Her engaging and elegant prose makes Alone Time as warmly intimate an account as the details of a trip shared by a beloved friend--and will have its many readers eager to set off on their own solo adventures. Stephanie Rosenbloom is the staff columnist for the Travel section of The New York Times, where she has been a reporter for various desks (including Styles, Business, and Real Estate) for more than a decade. She has appeared on CNN's American Morning, NBC's The Today Show, and NPR's The Takeaway. "[An] evocative, observant new book." "In a society that increasingly values connectivity, moments of solitude are hard to come by . . . 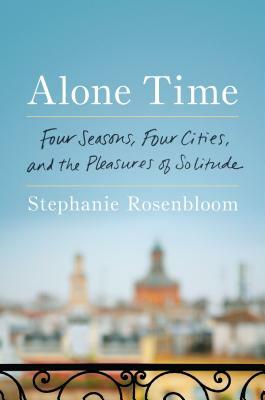 In Alone Time, Stephanie Rosenbloom reflects on her solo trips to Paris, Florence, Istanbul, and New York and offers even the most social of social butterflies strategies to reap the benefits of being alone." "[Alone Time] will make you want to be a tourist in your own city, and to stay logged out while you explore." "[Rosenbloom's] enthusiasm and eagerness are like that of a friend warmly reliving their favorite moments from a recent life-changing trip. And her happiness with her serendipitous discoveries along the way is infectious." "Rosenbloom offers a leisurely look at the simple treasures waiting to be uncovered by the solo traveler . . . She also unpacks research on the benefits to approaching the world with a willingness to try something new, and a commitment to staying in the present moment. The combination makes for a richly rewarding guide for any explorer, whether of distant lands or one's own backyard." "Alone Time is both a paean to its title and an invitation to anyone who has ever longed to explore a new city á seul." "A joyous, erudite new book that is sure to delight both travelers and armchair travelers, Alone Time is a shapeshifter. Much of it is an elegant and insightful travel memoir . . . but what gives the book its heft and intellectual grounding is the way Rosenbloom is able to use her own experiences as a jumping off point for discussions of the latest psychological and sociological studies into the nature of happiness. . . . It's a deeply satisfying mix for the reader, part travel guide, part guide to living."